I often find it fun to write sheet music for a tune I’ve learned by ear, and then compare my version to other transcriptions of the tune. And if I learn a tune from sheet music, I always listen to a recorded version to hear what it should sound like. 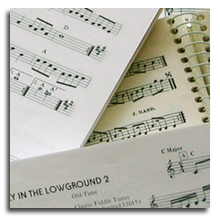 Here is sheet music I’ve created for a few of the tunes I especially enjoy playing. You can also listen to an MP3 file for each tune using the corresponding controller. If you are on a dial-up connection, it may take a while for the song files to load. The load status indicator on each controller will show you how much of each file has loaded. These are home recordings; I’m playing the melody on the dulcimer, unaccompanied, so you can hear what the tune sounds like. Periodically I will change the tunes available here, so check back every now and then. I hope you enjoy learning and playing these melodies! This is a tune I learned for a holiday music program several years ago when I was desperately searching for melodies with “Christmas” in the title. This one is from O’Neill’s Music of Ireland. This is one of the first tunes I learned to play, and still one of my favorites. It is said to be named for the morning in 1746 when the “Bloody Butcher” Duke of Cumberland slaughtered 5400 Highlanders loyal to Charles Stuart, ending the Jacobite rebellion. This might imply that the tune is from Scotland, but most likely it originated with Scottish settlers in West Virginia. Part of the African-American string band tradition (and also known as “Sailing on the Ocean”), this great little tune is now thought of as a Galax, Virginia, tune, even though it was played all through the Appalachians and Ozarks since at least the mid-1800’s. The title refers to the “wild side” of town.